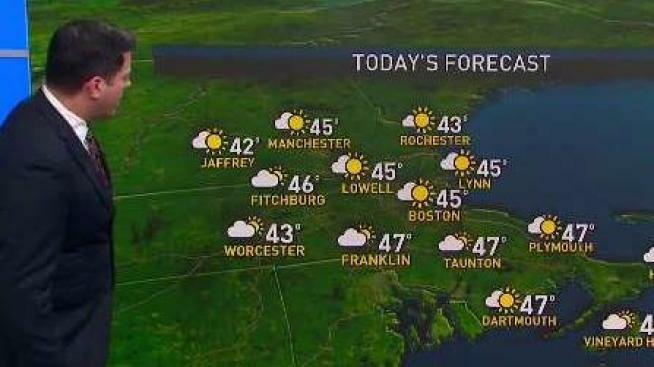 Sun to clouds, highs in the 40s. Overnight Thursday: Light rain develops. Lows in the 40s. Bright sunshine melts any early morning frost with temperatures slowly warming through the 30s to 40s south and 30s north. The next weather front pushing into New York will generate thickening and lowering clouds for a rather gray sunset. Our wind that briefly becomes light for sunrise increases from the south by afternoon at 10-15 mph, though may be gusting to 35 mph in the Champlain Valley of Vermont later. The next front is going to race in at night, with the rain showers likely after midnight, mixed with snow in the mountains. Temperatures overnight hold steady in the 30s to lower 40s. Friday may start off with a damp with showers in eastern New England, and an inch or two of snow in the mountains, but the sky will clear rapidly with temperatures rebounding to the 40s in southern New England, 30s north. Freezing weather returns again Friday night with high pressure from Canada, low temperature in the 20s. The weekend is starting to come in better focus with high pressure from Canada in control. That means more sun and clouds, with high temperature in the 40s, and low temperature in the 20s. Next week we see a dramatic shot of cold air entering the Great Lakes even as warm to record warm air over the southeastern United States tries to come back toward New England. That sets up quite a boundary with dry weather to start the week, but rain likely arrives by late Tuesday, as temperatures gradually cool we may see showers of rain on Wednesday, transition to snow by Thursday. It looks like an unsettled stretch, that may end up with white ground all the way to the coast by the end of next week. We will keep you posted as it gets closer.